Row 7: K15. Place marker. K10. Place marker. Increase by knitting into back loop, then front loop. K2. Increase by knitting into front loop, then back loop. K1. Row 9: K25. Slip marker. Increase by knitting into back loop, then front loop. K4. Increase by knitting into front loop, then back loop. Slip marker. K1. Row 11: K25. Slip marker. Increase by knitting into back loop, then front loop. K6. Increase by knitting into front loop, then back loop. Slip marker. K1. (36 sts). Row 15: K25. Place next 10 stitches on stitch holder. Cast on 4 stitches. K1. (30 sts.) You should now only have two markers--one on each edge of the hand, 15 sts apart. Row 1: *K1, ssk, k across to 3 sts. before marker, k2tog, k1, slip marker. * Repeat between * *s for other side. Row 7: K1. Place marker. Increase by knitting into back loop, then front loop. K2. Increase by knitting into front loop, then back loop. Place marker. K10. Place marker. K15. Row 9: K1. Slip marker. Increase by knitting into back loop, then front loop. K4. Increase by knitting into front loop, then back loop. Slip marker. K25. Row 11: K1. Slip marker. Increase by knitting into back loop, then front loop. K6. Increase by knitting into front loop, then back loop. Slip marker. K25. (36 sts). Row 15: K1. Place next 10 stitches on stitch holder. Cast on 4 stitches. K25. (30 sts.) You should now only have two markers--one on each edge of the hand, 15 sts apart. He looks so tickled with them! The mitten keeper clips with.... hmmm... ...I'm forgetting the name of those cartoon car guys.....will hopefully help to keep them from getting lost. .....especially after all your work of making them. 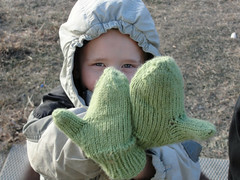 He looks smitten with his mittens :)thank you so much for the pattern. 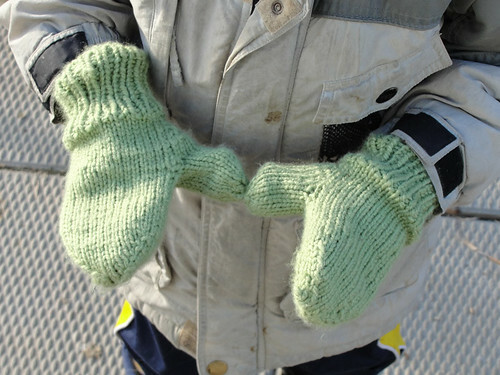 My daughter requested a pair of lined mittens that are long enough to go up the arm, as well as with the cord on them so this time my Grand-son couldn't take them off.. lol. 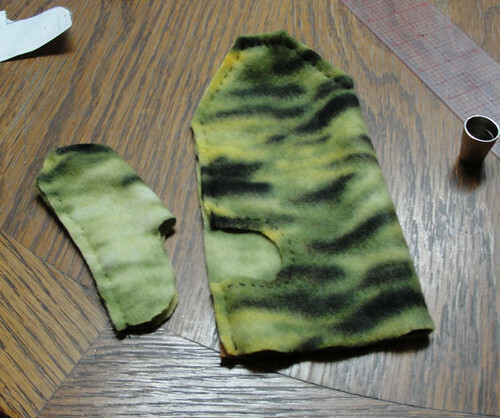 So, I will try to follow this pattern "tonight" and see what I can do to make them longer. I was born and raised in Alberta, so I know how cold it is there. But I still swear it's way colder out here in Manitoba. The advantage that much of Alberta has over Manitoba is Chinooks. We don't get them this far north, unfortunately, but I got them in Sylvan Lake, where I grew up. And I miss them!! Anyway, I've heard the horror stories of cold winters in northern Manitoba and Saskatchewan, and I wouldn't doubt that you do, indeed, have colder winters in general! 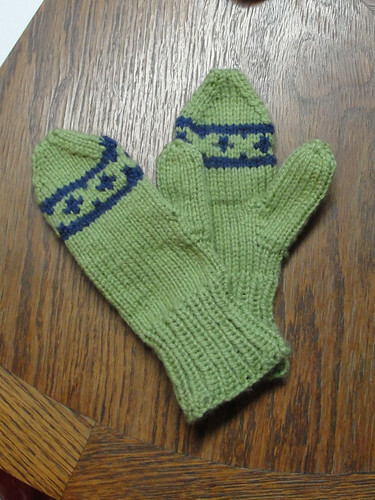 Hi, I'm on Ravelry. Found I don't have enough yarn.. darn it anyways,so I will have to put this on hold a bit.